The Iowa GOP will hold precinct-level Caucuses on February 3, 2020 and party chairman Jeff Kaufmann today said a presidential straw poll will be conducted that night. 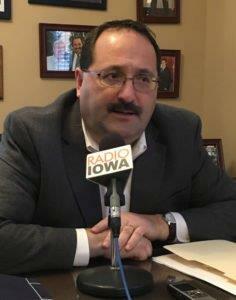 Iowa Republicans have cancelled Caucus night voting before when Republican presidents have been seeking reelection, but Kaufmann said current party leaders have no plans to cancel presidential preference voting in the 2020 Caucuses. Kaufmann has not publicly declared that he will seek another two-year term as Iowa GOP chairman, but no opponent has emerged for the party leadership vote in late January. The chairman of South Carolina’s Republican Party has said his state’s “first in the south” GOP primary may be cancelled as a show of support for President Trump. The chairman of Iowa’s Republican Party has been a vocal supporter of the president, going so far as to tell Republican Ben Sasse — a U.S. Senator — to stay on his side of the Missouri River back in June of 2017. “That was a way of telling Ben Sasse that I didn’t appreciate his comments attacking a brand new president right out of the gate,” Kaufmann said. But Kaufmann indicated now that “Caucus Season” is underway, Republican candidates are welcome to come into Iowa to challenge the president’s bid for re-election — and he’ll make some judgment calls about when to publicly defend Trump. Trump may have some “legitimate” foes from within the GOP by the time the 2020 Iowa Caucuses are held, according to Kaufmann, but Kaufmann doubts a challenger will find a foothold here. Ohio Governor John Kasich and Arizona Senator Jeff Flake have said they are considering the idea of challenging Trump for the GOP’s 2020 presidential nomination. Iowa Democrats will hold Caucuses on the same night as Iowa Republicans in 2020 and there are already a slew of Democratic presidential hopefuls lining up to campaign here.